Before describing some of the ways that the AAS has worked during the past year to improve the demographics of our Society so that it better resembles that of our larger national community, let me begin with a little history. George Ellery Hale led the effort to found the AAS in 1899 along with George Comstock, Edward Morley, Simon Newcomb, and Edward Charles Pickering, who wrote the Society’s constitution. Simon Newcomb became the first AAS President. Although the AAS online listing of AAS officers is incomplete prior to 1945, it shows that the first woman on the AAS Council was Yale astronomer Ida Barney (1946-1949) and that the first woman AAS President was E. Margaret Burbidge (1976-1978), who had previously served as the first woman AAS Vice-President. The composition of the Council has changed significantly over time, even since I served first as a Councilor in 1989. For example, since 2010 three of the four AAS Presidents have been women. And while on the current Coucil all three Vice-Presidents are men, six of the nine currently serving Councilors are women. Much of the effort to increase diversity in our Society is due to the work of our four Diversity Committees (Committee on the Status of Women in Astronomy [CSWA]; Committee on the Status of Minorities in Astronomy [CSMA]; Committee for Sexual-Orientation and Gender Minorities in Astronomy [SGMA], formerly Working Group on LGBT Equality [WGLE]; and Working Group on Accessibility and Disability [WGAD], which was formed in late 2015). These committees participated in organizing the Inclusive Astronomy Conference in 2015, which produced the Nashville Recommendations. These are now available on the AAS wiki, where individuals, institutions, and organizations can register their endorsement of specific recommendations and commit to their implementation. Please see the past post on the recommendations for more information, and please encourage your home institutions to support and implement the Nashville Recommendations. The AAS also recently adopted a new Code of Ethics, which I drafted with Jack Burns and Dara Norman and which was then improved with input from numerous Society members. Each person who wants to attend AAS or Divisional meetings or to become an AAS member is required to agree to abide by the Code. The intent of the Code is to be educational and corrective. A guide to our Code of Ethics can be found on the AAS website. Adam Burgasser, Jorge Moreno, and Nicole Cabrera Salazar facilitated a discussion about racism in astronomy at the 229th AAS meeting. Photo by Todd Buchanan/Corporate Event Images © 2017 AAS. Now a few highlights from the most recent AAS meetings. The 2017 AAS winter meeting, held in Grapevine, Texas, featured a Town Hall on Racism in Astronomy, organized and sponsored by the CSMA. This very well attended Town Hall began the Society-wide conversation on the problem of racism in astronomy. Reactions were very positive, with many of those in attendance saying they felt energized to do more to confront racism at their home institutions. For those who missed the event or who would like more information, the Astronomy in Color blog features a summary of the Town Hall and a list of resources and ideas to confront and eliminate racism in astronomy. A highlight of the summer AAS meeting in Austin (Texas again!) was Professor Hernán Quintana’s plenary talk and receipt of the AAS Education Prize for his devotion to increasing opportunities to obtain astronomy degrees at Chilean universities. An official policy had limited admissions to bachelor’s and master’s programs to the number of future positions available. Coupled with the economic crises of the 1980s, this policy severely limited growth in astronomy higher education. Professor Quintana’s vision has led to Chile now having one of the fastest-growing astronomy communities in the world, with significant growth in both postdoctoral and faculty positions. 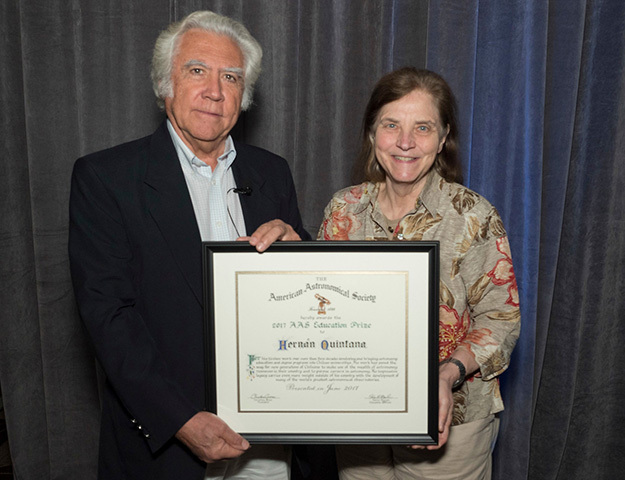 Hernán Quintana receives his AAS Education Prize from President Christine Jones at the 230th AAS meeting in Austin, Texas, in June 2017. Photo by Phil McCarten/Corporate Event Images © 2017 AAS. Following the AAS Austin meeting was the conference “Women in Astronomy IV: The Many Faces of Women Astronomers.” It focused on addressing challenges specific to women and what institutions can do to create welcoming, equitable workplaces. The opening talk on privilege by Peggy McIntosh, from the Wellesley Centers for Women, appropriately set the tone for the first day. Other topics included implicit bias and sexual harassment. Possible topics for white papers to be submitted to the forthcoming decadal survey include “Best Practices Around Graduate Education” and “Policies Around Family Leave and Caretaking.” The conference included lots of networking by the participants and the sharing of experiences, along with many concrete action items the attendees are taking back to their home institutions. I would like to mention the impact that the Women in Astronomy conferences have had on our profession. The first conference (“Women at Work: A Meeting on the Status of Women in Astronomy”) was held in September 1992 at the Space Telescope Science Institute. One of the important results from this meeting was the now well-known Baltimore Charter for Women in Astronomy, which included five important recommendations and a “Call to Action” that says, “Women want and deserve the same opportunity as their male colleagues to achieve excellence in astronomy.” The second conference, “Women in Astronomy II: Ten Years After,” was held in 2005 and produced the document “Equity Now: The Pasadena Recommendations for Gender Equity in Astronomy." “Women in Astronomy III: Meeting the Challenges of an Increasingly Diverse Workforce” was held in 2009 and hosted by the University of Maryland and NASA’s Goddard Space Flight Center. The proceedings from this meeting are available as a PDF. After more than 50 years of basically the same governance structure for the AAS, the Council appointed a governance task force led by former AAS President David Helfand in early 2016 to determine if the governance of the AAS should be updated. The recommendations of the task force were presented to the AAS Council in January 2017 and were unanimously approved. A PDF of the full report of the governance task force is online. In summary, the governance task force recommended that the current 20-member Council that meets twice a year be replaced by an 11-member Board of Trustees that meets monthly, with four face-to-face meetings and eight telecons each year. To involve a broader community in setting strategic directions for the AAS, the Board and the chairs of the 11 Standing Committees as well as Division representatives would meet together twice a year with the goals of 1) fostering collaboration, 2) improving communication, and 3) guiding the strategic thinking of the Society. In addition each Committee and Division chair would attend from two to four Board meetings each year for discussions of issues related to their Committee or Division. The AAS membership is now being asked to vote on whether to approve these recommendations. If you have not already cast your ballot, please do so before 31 July; see the post about the vote on these recommendations for more information. Following the recommendations of the AAS Journals Futures Task Force, in February 2016 a single manuscript-submission site was opened for three of our research journals (the Astronomical Journal, the Astrophysical Journal, and the Astrophysical Journal Supplement Series). The Astrophysical Journal Letters retains its separate manuscript-submission site and editorial team. Papers can now be submitted to one of seven topical corridors (Galaxies and Cosmology; High-Energy Phenomena and Fundamental Physics; Stars and Stellar Physics; The Solar System, Exoplanets, and Astrobiology; Interstellar Matter and the Local Universe; The Sun and the Heliosphere; and Instrumentation, Software, Laboratory Astrophysics, and Data). More information and detailed instructions for submitting papers is available at journals.aas.org. In addition, the Society now publishes AAS Nova, with concise research highlights from the AAS journals. 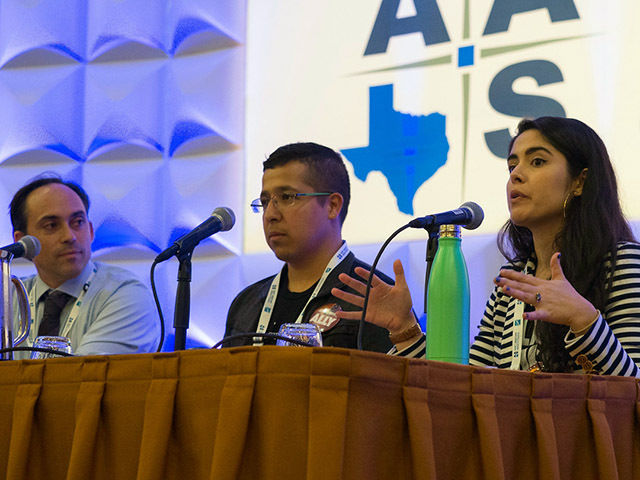 During AAS meetings, the AAS Nova team has been partnering with Astrobites bloggers to provide daily summaries of plenary talks, press conferences, and other conference activities. 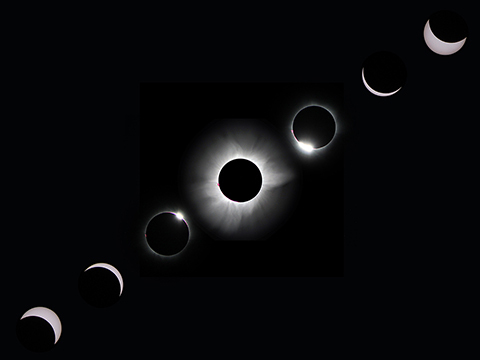 The total solar eclipse of 9 March 2016 from Indonesia. Photo by Rick Fienberg / TravelQuest International / Wilderness Travel. Finally, I know you’re aware that on Monday, 21 August 2017, a total eclipse of the Sun will cross the United States for the first time in nearly a century. The 70-mile-wide path of totality extends from Oregon to South Carolina, starting at about 10:15 am Pacific time on the West Coast and ending about 90 minutes later on the East Coast. Within that path the total phase of the eclipse lasts up to 2 minutes 40 seconds; outside it the rest of the continent gets a partial eclipse — but we’re all heading for totality, right? Be sure to check the local weather forecast on August 20th before choosing a final viewing spot. And remember that to watch the partial phases of the eclipse you will need proper eye protection, as described on the wonderful website created by the AAS Solar Eclipse Task Force. I’ve been to only one total solar eclipse, and it wasn’t clear. Hopefully this year will be better!